The "Rumi Redux" uses influences from the 13th century Persian poet, Rumi. The imagery (and Arabic calligraphy) is inspired by the famous 12th century Persian scientist, al Jazari. The back-lit, glowing “All Seeing Eye” is inspired by an 18th century painting found in an old English masonic lodge. The flaming comet is accurately hand painted and taken from the 16th century "Wunderzeigenbuch" (The Book of Miracles) created in Augsburg, Germany. This book was the worlds' first secular documentation of scientific occurrences in the natural world without ascribing these events as having religious origins. The Elephant medallion is painted in goauche and inspired by an early illuminated text. The crescent moon is a 2" thick, plano convex lens which is then back-lit and rear painted in deep red to evoke earth shine. The solid mahogany base is painted in pale matte gray with hand made brass and silk tassels. 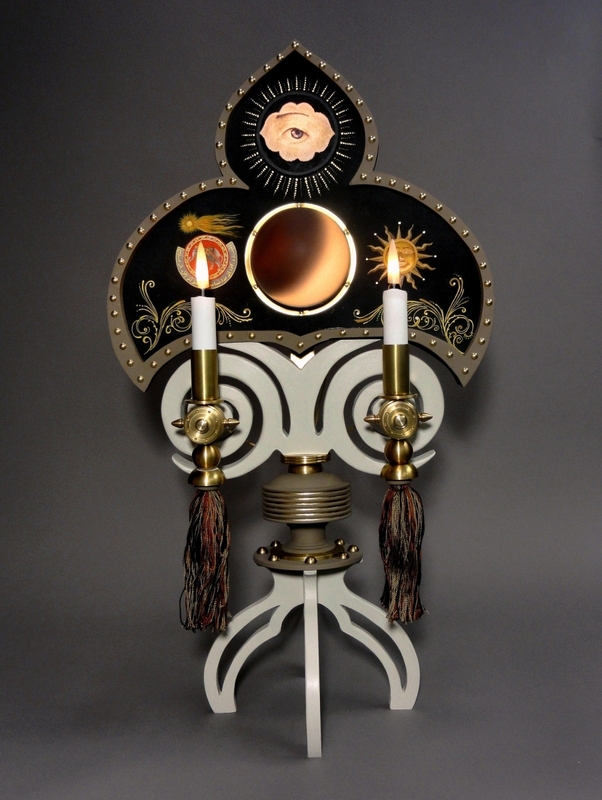 The two electric candles oscillate in a most realistic recreation of an actual moving candle flame.